Every few months, a letter purported to have been written by Jawaharlal Nehru to the then Prime Minister of England Clement Attlee surfaces on social media. And what follows is a blame-game where-in Nehru is slammed for referring to Netaji Subhash Chandra Bose as a “war criminal” while the defenders of Nehru claim that the letter is fake. From the language, grammar and choice of words, it doesn’t appear to be a letter from a well educated man like Pandit Nehru. So is this letter fake and photoshopped? The physical form of the letter i.e. the above images may certainly be fake. But, it appears that the images are a recreation of the letter which is said to exist. A mention of this letter appears in a book called “Judgement: No Aircrash, No Death (2010)” written by Lt. Manwati Arya who was born in Burma and joined the INA’s women’s wing. 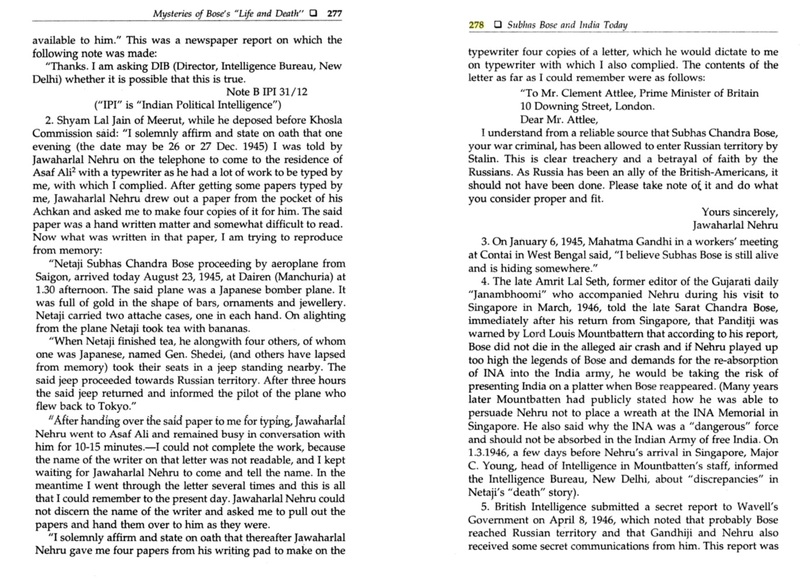 The letter is also mentioned in the book “Subhas Bose and India Today: A New Tryst with Destiny ?”. This book gives the exact source of this letter. The book claims this is part of a sworn testimony by Shyamlal Jain, the steno of INA Defence Committee secretary. Jain claims to have typed this letter. B. The letter was written after the date of Bose’s death, which only means Nehru knew that Bose was alive even post the declared date. This letter by Nehru is likely to set off a political furore in India as it feeds the long held notion that Nehru was unfair to the legacy of the great Netaji Bose. Netaji was supposed to have died on August 18, 1945. This letter was written four months after Netaji’s supposed death in plane crash in Taipei. 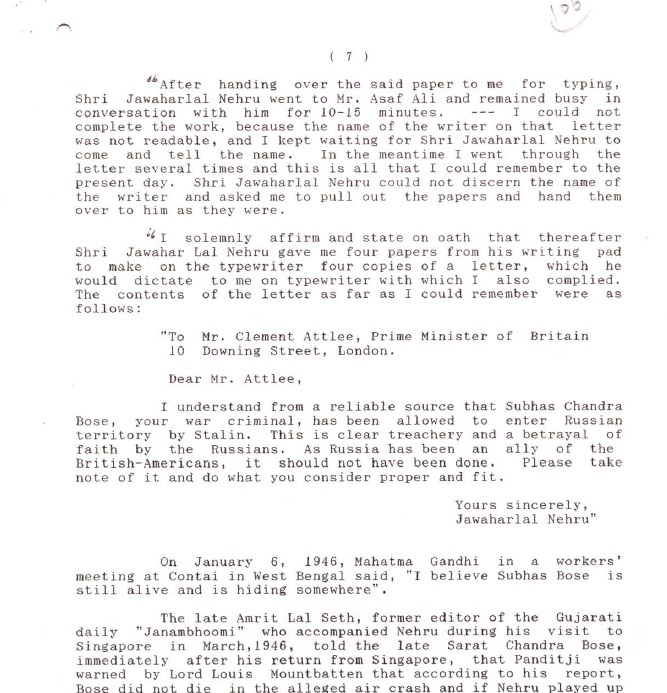 What this letter also reveals is that Nehru did not believe that Netaji had passed away in the plane crash and felt that Subhas Bose had someone managed to sneak into Soviet Russia. The letter which shows Nehru call Bose a war criminal has long been part of speculation but has never been in the public domain before this. Going into damage control, Congress leader Anand Sharma alleged that the letter was fake and mischievous act to malign Congress. Sharma without naming anyone said that the Congress will expose the conspiracy behind the letter and will take action against the person who has done that. So what did the declassified documents say? Did they have this letter? They confirmed the existence of the sworn affidavit of Shyamlal Jain, the steno who made the claim that he wrote the letter. The actual letter is not there in the currently declassified files but they do refer to Mr Jain’s affidavit. But will we ever find this letter in the archives? Will it be available in future releases of the archives? The chances are remote. The letter was written before Indian Independence and consequently before the Government was formed. It was written by Nehru in his personal capacity or as the leader of Congress. It has nothing to do with any Indian Government, so the chances of it ending up in Indian Government archives is almost zero. Further, even if it did reach there, who is to say such a damaging letter was not destroyed? Further, can this letter be in the UK Government archives, as it was addressed to the UK PM? Probably not, considering these are the kind of documents which they archive. Since the letter may not be found in either Indian or UK government archives, we have to depend upon the existing evidence, which is an under-oath declaration by Mr. Jain. Was Mr. Jain lying under oath? If Congress leaders are to be believed, he was.